Lavera Vegan Regenerating Shower Oil-Cream delicately cleans your body while providing the moisturizing properties of its natural active ingredients. Its richness in organic argan oil contributes to the maintenance of the hydration of the skin as well as its softness. Composed of organic cranberry with antioxidant properties, this shower cream slows down the skin aging process and helps regenerate the skin. Its creamy texture provides a real moment of sweetness. Due to its softness, Lavera Vegan Regenerating Shower Oil is suitable for all skin types. It will be particularly appreciated by dry and demanding skin. 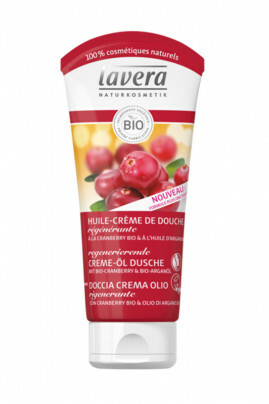 Lavera Shower Oil Cream cleans and moisturizes your skin! In the shower, apply moisturizing Lavera Vegan Regenerating Shower Oil to the skin, lather and rinse thoroughly. In case of contact with the eyes, rinse thoroughly with clear water. A natural composition to gently wash the body!